Ok, Astartes X and I are building a diorama for a lady friend of ours for when she graduates high school near the end of May. We&#39;d like feedback of how to improve it if possible. The models are intended to represent us: the Cannoness at the center is to be an Inquisitor Lord (Lady? ), whilst the two Space Marines flanking her will be Deathwatch Brothers, drawn from the Black Templars and Storm Crows (mine and Astartes X&#39;s respective favorite chapters). This is represntative of the fact that she views us as her bodyguards/protectors/guardians/etc. The Templar will have Helbrecht&#39;s sword attatched to his right arm, and the Inquistor Lady will have a Sister Repentia Mistress&#39;s whip-arm for her left arm. The Marine with the tentacled fist and mohawk is intended to be a Storm Crow Librarian: the GS on his hand is to represent Storm of the Emperor&#39;s Wrath, while the GS on his head is going to be a psychic hood (but looks like a mohawk ATM). The fact that they are on a dreadnought base is representative of nothing more than I am not confident in my skills of building my own base, so I ordered an existing one. We&#39;ll take all comments and criticisms that come our way. Thanks in advance to anyone who gives feedback. Well, make sure you trim up the sprue lines on the backpacks. They have a way of popping out visually if you miss them. I like the choice of the dreadnought base, although I would make sure to add some flock and/or static grass to the crevices. When used as a diorama base, it needs a little more attention than when used for a single mode. I might add a thin layer of green stuff over the tentacle-looking things on the Librarians hand, and then texture it with a wet knife-edge. You want it to look like energy rather than tentacles, so starting with some flowing surface texture might help you paint it. I would also consider adding something to the empty space behind the models. Perhaps a planted standard if you fancy some flatwork? You want the viewer&#39;s eye drawn to the center, then off to either side. As it is now, I feel like my eye is going first to either the left or right marine, then crossing over her head to the other marine, then dropping down to her last. Adding a strong vertical element to the diorama may help with that, or using lighter colors on the Inquistor than on the flanking marines. Looks good, though! That is an awesome idea for a graduation present, and you have really done a good job with the composition. The sprue lines are gone now. And I&#39;m definately going to add some stuff to the base. I was just pointing out that neither of us are confident we can scratch build one. I&#39;m not quite sure what you mean by this... Should the "lightning" be smooth or sorta chopped up? Astartes X said to just smooth it out, but he&#39;s been exposed to a lot of sun this week and is about to take the SAT, so he&#39;s crazy. Thanks for the feedback, Khanaris. We&#39;re not sure quite what we&#39;re gonna do with the empty space back there, but we&#39;re thinking on it. Banner, or maybe a tree. Or possibly just painting the Inquisitor so she&#39;s more visually arresting than her Deathwatch bodyguards. On a related note, does anyone have some good recommendations on how to do golden-blonde hair? I did a search for simply "blonde hair", but the best it came up with was strawberry or dirty blonde, with ideas on how to make it look dyed or bleached. Well, the trick right now is going to be making it look like lightning. The strands of green stuff may be a little thick for that. Texturing might not help in that case. You might be better off painting an illumination effect from it. Looks good already, though the Death Watch always have their Inquisitor shoulderpad on the left side. The right side is reserved for the chapter they hail from. 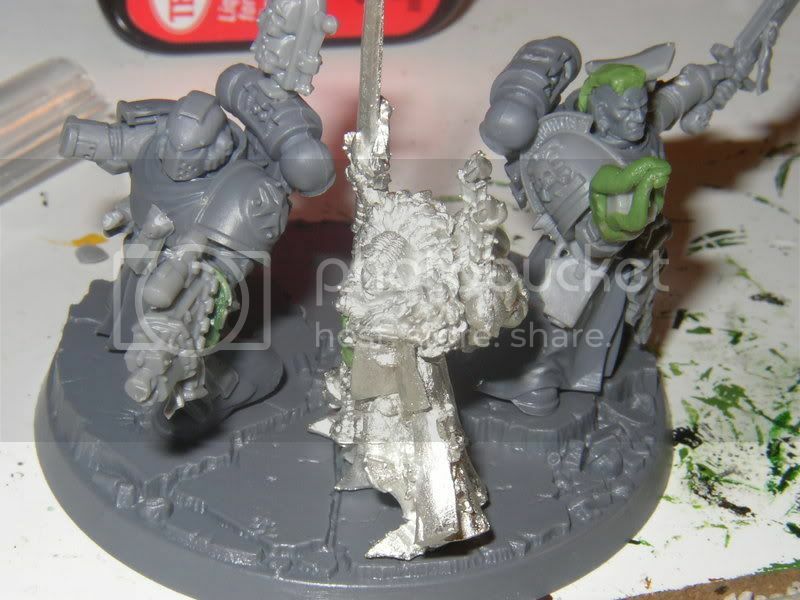 And what is the GS blob on the hand of the right marine supposed to be? I think it&#39;s supposed to be Psychic stuff? Not very Inquisitorial since they hate Psychers..
Anyways I hope this helps you a bit. Oops. :P Oh well, too late now. Eh? Inquisition, hate psykers? I doubt that, seeing as how they&#39;ve got a lot of psychic Inquisitor Lords and Inquisitors, not to mention they employ Space Marine Librarians a good bit. In fact, in CS Goto&#39;s book Warrior Brood, the Deathwatch team that the story revolves around ends up having not one, but two librarians on it (it was special circumstances, but still). That and a Black Templars chaplain (talk about having to paint your armor black... : ). Alright, that&#39;s close to what I was planning to do anyways. A little off topic, but I believe it would be best said that the Inquisition hates rogue psychers. Beyond that and back to the matter at hand, I really love the idea. The thought behind the idea already makes it an incredible gift, and the meaning is only going to get magnified by how well you put the end result together. I&#39;d agree with Khanaris on the standard, as only using 3/4 of the base in a sort of roundabout pattern is rather wasteful, and having such a large gap at the back may come back to haunt you. However, I don&#39;t find my attention is pulled directly left to right (or vice-versa) as he said. I honestly think it&#39;s more a result of the fact that you currently have a solid metal miniature surrounded by plastic ones, and that the detail of a shiny Cannoness is pretty much lost, while the other two are still easily visible. The whole thing might clear itself up once you have them all in the same color (primed) or when you&#39;re finished. Again, I only think you should add something at the back because you&#39;re wasting too much space otherwise, and a banner is a great way to fill that space, and add something to the scene (even if all you were to write on it was "Congratulations!" or some equivalent). You wouldn&#39;t happen to have a link for that thread, would you? I&#39;m checking now, but if you could give me a point in the right direction, that&#39;d be awesome. Sweetness! That&#39;s exactly what I&#39;ve been looking for! Thank you so much! Someone give this man a karma cookie for his time (I would, but I&#39;m not a mod :P). Just my personal preference here, but, building off of previous ideas, how about making a battle-damaged banner for in the background?